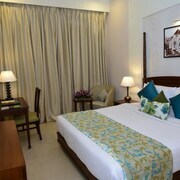 Country Inn & Suites by Radisson, Goa Candolim features an outdoor pool and a fitness centre. The hotel offers a restaurant. A bar/lounge is on site where guests can unwind with a drink. A complimentary breakfast is offered each morning. Business-related amenities at this 4-star property consist of a business centre and a meeting room. This Art Deco hotel also offers tour or ticket assistance, multilingual staff and concierge services. On-site self-parking is complimentary. Country Inn & Suites by Radisson, Goa Candolim has designated areas for smoking. 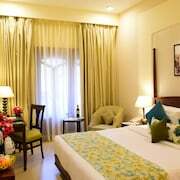 Situated by the sea, this hotel is within 3 miles (5 km) of Candolim Beach, Calangute Beach and Fort Aguada. Sinquerim Beach and St. Anthony's Chapel are also within 3 miles (5 km). A restaurant, an outdoor pool and a fitness centre are available at this hotel. Free buffet breakfast and free self parking are also provided. Other amenities include a bar/lounge, 24-hour room service and a business centre. All 96 individually decorated rooms feature free WiFi and pillowtop beds. For a bit of entertainment, guests will find LCD TVs with satellite channels, and other amenities include 24-hour room service and private gardens. 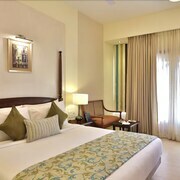 Country Inn & Suites by Radisson, Goa Candolim offers 96 forms of air-conditioned accommodation which are accessible via exterior corridors, and features minibars and a safe. Each accommodation is individually decorated. Beds feature pillowtop mattresses. 32-inch LCD televisions come with premium satellite channels. Bathrooms include a shower and complimentary toiletries. Guests can surf the web using complimentary wireless Internet access. Business-friendly amenities include desks and complimentary newspapers. Additionally, rooms include complimentary bottles of water and coffee/tea makers. An iron/ironing board and hairdryers can be requested. A nightly turndown service is provided and housekeeping is offered on a daily basis. Palmas Restaurant – Overlooking the pool, this restaurant specialises in international cuisine and serves breakfast, lunch and dinner. Guests can enjoy drinks at the bar.